DIN Rail used for mounting electronics in a panel. 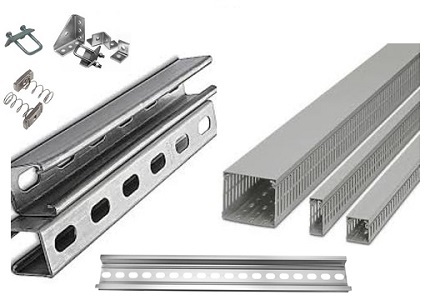 The din rail is mounted to the back plate in the enclosure and allows you to install, remove, and re-arrange components with din rail mounts as needed. Wire Duct allows you to keep wiring neat and clean in the panel by routing wire through the duct fingers on the sides while keeping the wire straight in the ducts. Struts are for mounting equipment and cabinets in all types of environments.